Badi Mahal also known Garden Palace is a marvelous structure constructed during 17th century. 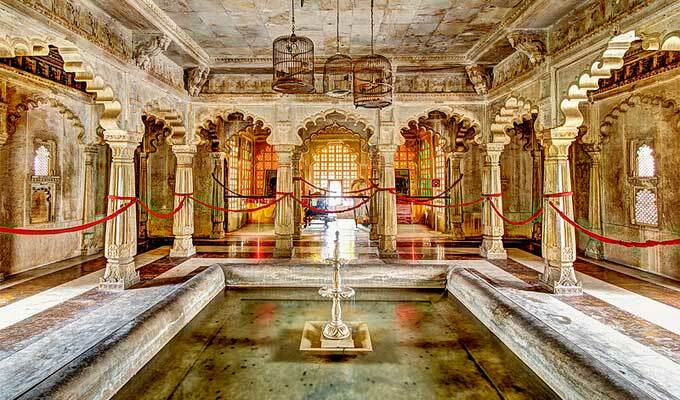 This Badi Mahal also known as the Men's section of the City Palace, built on a 90 feet high natural rock formation. Garden Palace is a rare combination of Rajput and Mughal architecture style known for its beautiful garden, greenish landscaped lawns, vast courtyards, massive pillars and terraces, royal balconies, attractive fountains and royal apartments.Badi Mahal also has luxurious rooms with painted mirrors, ornate ceilings, attractive carvings on the walls and nice portraits. By Road: Badi Mahal is located near the Lake Pichola in the heart of Udaipur city. One can easily reach here with local taxi, roadways or private buses or cab. By Rail: Badi Mahal, Udaipur is well connected through nearest Udaipur Railway station to major cities railway stations like Delhi, Agra, Mumbai, Chennai, Bikaner, Jodhpur, Jaipur, Ahmedabad. By Air: Badi Mahal can be reached through nearest Udaipur Airport which is well connected with regular domestic flights to Delhi, Kolkata, Mumbai, Ahmedabad, Jodhpur and Jaipur.